George Raft (born George Ranft; September 26, 1901 – November 24, 1980) was an American film actor and dancer identified with portrayals of gangsters in crime melodramas of the 1930s and 1940s. A stylish leading man in dozens of movies, Raft is remembered for his gangster roles in Scarface (1932), Each Dawn I Die (1939), and Billy Wilder's comedy Some Like It Hot (1959), as a dancer in Bolero (1934), and a truck driver in They Drive by Night (1940). In 1946, Raft earned a reported $108,000 for the year. Raft announced he had created his own production company, Star Films, with Sam Bischoff as president, and would make three films in two years for $3.5 million. 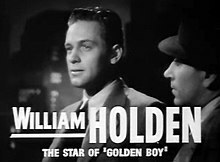 He and Marin returned to RKO to make the film noir Nocturne (1946), produced by Joan Harrison which was popular. 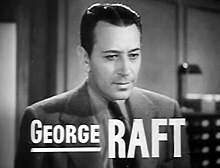 Raft's next three films were all directed by Marin: Christmas Eve (1947), at United Artists for Bogeus, a box office disappointment; Intrigue (1947) at United Artists for Star Films; Race Street (1948) at RKO. In June 1947 Raft received some bad publicity when his friend Bugsy Siegel was murdered. However the following year Heda Hopper wrote a profile on Raft which said the actor was "going stronger than ever today" adding that "he has made millions but hasn't got 'em" due to a fondness for gambling and a loyalty to helping old friends. ^ GEORGE RIDES HIGH: LOOKING AT HOLLYWOOD WITH HEDDA HOPPER RAFT Chicago Daily Tribune 31 Oct 1948: b8.